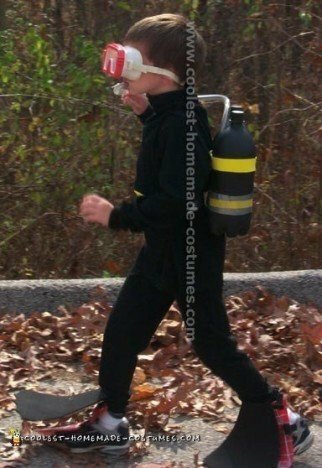 My son came home from school two weeks before Halloween and told me that he wanted to be a scuba diver. Thiscostume was so easy and very inexpensive. Originally I was going to use a black sweat outfit, but it ended up being warm on Halloween so I went with black stretch pants and a black turtleneck. I use two 2-liters that I had spray painted with black paint for air tanks. Then I used duck tape and yellow foam core to make strips around the "air tanks". I attached black elastic to the sides so my son could slip the air tanks over his shoulders, attached clear plastic tubing to the top of the tanks and then to his snorkel mouthpiece. I used duct tape again to make a belt and a buckle, which were made out of foam core. Then I made flippers out of black foam core and attached them with a string to his ankles. One note: He had trouble walking with the homemade flippers so for Halloween we actually used a pair of flippers he already had (I wish I had a black pair – I think it would have looked better for his kid costume).